THE CHARLESTON COMMUNITY: Charleston, South Carolina is considered one of America’s most beautiful cities with historic attractions, lovely churches and synagogues, museums and galleries, world-class shopping, and a multitude of opportunities for outdoor recreation, including fishing, boating and golf. Its historic streets are lined with numerous picturesque and architecturally significant homes. The surrounding areas offer world famous gardens, elegant plantations, beautiful sand beaches, islands, creeks and rivers. Charleston is frequently mentioned as a top destination in the United States and has been noted as one of America’s Most Civilized cities. Recently, Charleston was listed as one of “America’s Favorite Cities” by the Travel + Leisure/CNN Poll, listing Charleston as the #1 city in the Friendly People category and # 2 for its architecture and notable buildings, antiques, flea markets, home design stores and pedestrian friendliness. Quality education, transportation, healthcare, a variety of affordable housing and low taxes combine to create an ideal environment for personal and business endeavors in Charleston. The Charleston metropolitan area is comprised of three counties with a total population exceeding 600,000. Significant growth is anticipated over the next five years as the area continues to be recognized as an ideal location to live, work and relax. Education: Recently, schools in Berkeley, Charleston and Dorchester counties have all earned a number of incentive awards for exceeding educational goals under the Education Improvement Act, demonstrating the strong commitment local educators have made to achieve excellence in public education. The area is also home to 65 outstanding private and parochial schools, offering a wide variety of educational options. Scenic Attractions: Nature and history enthusiasts will find an abundance of wildlife refuges and pre-Civil War plantations. For bird watchers, the Cape Romain National Wildlife Refuge, Bull’s Island and Drum Island offer more than 250 species. Among the plantations open to the public are Middleton Place, Magnolia Gardens, Drayton Hall, Boone Hall and Cypress Gardens. The Arts: The area offers a wide variety of cultural events year-round. The Charleston Civic Ballet, Charleston Opera Company, Dock Street Theatre/Footlight Players, Greater Charleston Symphony Orchestra, just to name a few, perform seasonally. The Charleston Museum, Gibbes Art Gallery, Historic Charleston Foundation/The Preservation Society and the South Carolina Historical Society offer workshops and tours throughout the year. The Spoleto Festival, an internationally recognized and acclaimed arts event, is held throughout Charleston in late May/early June each year. People come from all over the world to enjoy the symphony, dance, theatre, jazz, opera, chamber and choral music, and visual arts during this 17-day festival. 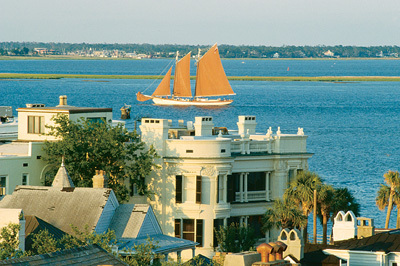 Please visit www.charlestonchamber.net or http://www.charlestoncvb.com/visitors/ for more information about Charleston.